“The Twelfth of Never” is a colloquial expression referring to a hypothetical event that will never happen in the course of one’s lifetime, and one that is unlikely to occur at all. 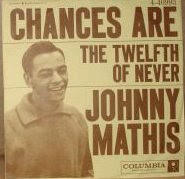 It is also the name of a frequently covered pop song that was a hit in 1957 for Johnny Mathis. Since “The Twelfth of Never” is a love song, the title refers to the moment in time when the singer will ever stop loving his beloved—in other words, never. Since he’ll never stop loving her, he will love her “forever.” Randy Travis sings in the song that became a No. 1 hit, “Forever And Ever, Amen,” “If you wonder how long I’ll be faithful/I’ll be happy to tell you again/I’m gonna love you forever and ever, forever and ever, amen.” As the saying goes, love, like a diamond, lasts forever (amen), except for the skeptic Arthur Lee, who perversely titled Love’s third album Forever Changes (1967), in flat contradiction to the widespread sentiment that love lasts forever, even though he often sang very much like Johnny Mathis on that album. Thus is my preamble to a blog entry in which I originally set out to discuss songs with numbers in them, prompted by hearing Tommy Tutone’s marvelous “867-5309/Jenny” on the car radio the other day. But I discovered that at least one site has already done something like what I set out to do, so there’s really no need, as the saying goes, to reinvent the wheel. However, lists of songs with numbers in them is one thing; what they mean is, well, a horse of a different color. There is one particular song with numbers in the title that has always especially interested me—Jimi Hendrix’s “If Six Was Nine,” on Axis: Bold as Love (1967). In 1967, when Hendrix recorded the song, he was writing within a long tradition of pop and rock songs with numbers in them—and a time about ten years after Johnny Mathis recorded “The Twelfth of Never.” Just to get a feel for the subject, I’ve listed some pop songs (including country songs) with numbers in them, in order to reveal the affinity “If Six was Nine” has with songs such as “The Twelfth of Never.” I should add that I’m reasonably confident that all of the following songs appeared before the recording of "If Six was Nine," in October 1967. The list should not be considered exhaustive by any means. 3: Three O’Clock Rock, Wednesday Morning, 3 A.M. Hence “The Twelfth of Never” points to a non-event, a moment in sequential, calendrical time that will never happen, a point in time that will never be reached. Just like the “33rd of August,” it refers to an impossible moment in time. In my view, "If Six was Nine” refers to this same impossible moment, a mathematical impossibility, the non-moment in Never when six shall be nine. For me, the song is a declaration of independence. I hear Thoreau in the song, and his statement, "If a man does not keep pace with his companions, perhaps it is because he hears a different drummer. Let him step to the music which he hears, however measured or far away." I don’t care, I don’t care. Dig? But I’m gonna wave my freak flag high. High! In other words, the day will never come when I'll be like you. So there. Jimi was interested in the esoteric significance of colours—the ‘vibratory’ power of colour that lies behind expressions such as ‘green with envy,’ ‘seeing red,’ and ‘feeling blue.’ As a lead-in to the last verse . . . Jimi introduces colour symbolism to reinforce the enigmatic nature of his lyrics (‘there ain’t nobody knows what I’m talkin’ about’). He speaks of ‘purple, red, yellow and green’ where (in ancient scripts) purple rays make the individual a self-ruler, red is the colour of the pioneering spirit, green is the ray of balance and harmony achieved through struggle and conflict, while yellow is the colour of creativity. The final occult inference in the song is located in the title itself: in the I Ching commentary, 6 is one of the numbers of Earth, 9 one of the numbers of Heaven.... (225-26). I’ve never actually heard Hendrix say the four colors that Shapiro and Glebbeek refer (I can’t make out what he is saying, despite the many dozen times I've listened to the song on headphones; I do admit, however, that he is saying something), but I’ll take their word for it. Most certainly colors--in the sense of one's "true colors"--are invoked by his reference to "flag," which carries one's "standard" in a military sense, or identifying colors. "Freak flag," of course, suggests unusual colors, or perhaps even black, as in skin color. And if--as Shapiro and Glebbeek claim--in the I Ching, 6 is indeed one of the numbers of Earth and 9 one of the numbers of Heaven, then the idea of the two places ever possibly being the same names an impossible moment in time--just like "the twelfth of never." Good to come across your blog again.